I recently was asked how do I add fields to my Vault file list. It's actually much easier than you realize, once you know where to look. Here's the fields that I currently have shown in my file preview. My next step is to go ahead and add a new one. First, all I have to do is right click on the title bar. 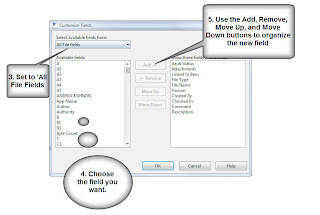 This brings up the 'Customize Field' dialog box, where I can choose the fields I want to add or remove. Note that you may have make sure the pulldown in the upper left is set to 'All File Fields', if it's set to 'Frequently Used Fields', it may be blank (since no fields may have been used frequently in your case)! Once this is done, hit okay, and the new field will appear (or the ones removed will disappear). In the example below, I used the 'Add' button to insert a 'Last Write' field (circled).